Of course, it means there's work to be done. God has blessed us with a tremendously talented team of volunteers who give us their time and energy creating great content for you. I have had a wonderful time writing the Warren and the World for the last 58 weeks. And now, it's going to get even better. I'm pleased to introduce Carolyn C Givens, my successor as the writer / editor / compiler of the Warren & the World. Carolyn is a wonderful writer and a lovely person. She's served us tremendously as we launched Inkwell, and now she's going to serve you here. My experiences with Carolyn have shown her to be the kind of person who is truly on your side. At the end of the day, that's what we're here for. Whether it's through original content on the site, short stories to read aloud, a conference to help develop artistic expression, or book-length content, we're here to serve you. We're your allies. Allies in Imagination. In this together. Tim Challies addresses the ebb and flow of the readerly life, and the benefit of not limiting ourselves to only "Christian" material. He challenges us to read with discernment beyond our borders, filtering everything through a Christian worldview. My practice of reading goes through phases. There are times where I just cannot get enough of the newest Christian books, and there are times where reading yet another Christian book seems almost intolerable. In some seasons I love to read novels, and in some seasons I can’t stand them. I’m sure any committed bibliophile can identify with the ebb and the flow of the literary appetite. Over the summer I found myself gravitating away from books written by and for Christians, and toward books meant for the general market—books on productivity and habits and software and organization and communication and life. I found myself enjoying them a great deal, and benefiting from them in unexpected ways. Though they were written by and for unbelievers, and though many were outright antagonistic to the gospel, they helped equip me to live as a Christian. He goes on to liken the practice of reading with discernment to the act of building a model F-16. Read more. Lore Ferguson is a writer whose path has crossed mine on the interwebs enough times to make me perk up when I read her name in a byline. I recently found her personal blog and came across this post. Reading it, I was challenged to examine all my relationships and to consider whether I, also, could be a poet of people. A friend told me that he and I are farmers at heart, driven by seasons and weather, but that right now we’re called to cultivate people instead of earth. I cried when he said that because people are made of earth too, but it’s hard to tell with all the concrete around. A few weeks ago I met with one of my pastors who stared incredulously at me when I listed all the things I’m doing and how spent by it all I am. I nearly wept right there. It has been a long time since someone said those words to me and I had forgotten. "People are made of earth too…" Read more. Who doesn't love a good book list? Especially when that book list mentions people like Sally Lloyd-Jones and Rudyard Kipling. Redeemedreeder.com has a few suggestions for each age group. Are your kids’ book bags feeling heavy this fall? How bout a few enjoyable reads to lighten the load? Thanks to each of the Redeemedreader writers who helped me put this list together! We very much hope you and your kids will appreciate this short list of fun yet faith-friendly backpack additions. Some great stuff here. Read more. We're all busy. Parents perhaps busier than others. Moms perhaps the busiest of all. And finding a few moments to meditate on God's Word, much less have an extended "quiet time," can feel like a joke sometimes. Kristen Pittman, a new mom, writes for the Church at Charlotte blog about the presence of Scripture even when we don't have time to write our notes and mark devotions off our to-do lists. The blinking cursor on a blank screen has mocked me often this week. So many times I’ve started putting words to page only to stop, delete and begin again. It’s not for want of thoughts or ideas. There are plenty. Rather, that’s just how life has been since my daughter came nearly five months ago. Things happen in fits and starts, paused and begun anew as I’ve gotten my feet beneath me on the road of motherhood. That’s how time with Jesus has been too. A couple of minutes here. Some seconds there. Most of them happen in the dead of night or the earliest hours of morning through prayers offered to the rhythm of a rocking chair, songs sung silently in the stillness of a sleeping world. The gospel: transforming minds, one rocking chair session at a time. Read more. Julie Silander looks back at a summer that didn't happen the way it was supposed to. The summer began as expected – the usual swim meets, family movie nights, and a welcomed shift to a slower pace of life. Days were clear and bright. Nights twinkled with fireflies. Then the storm hit. We hadn’t anticipated the downpour – or the consequential damage. In hindsight, dark clouds had been brewing for a while, but we had been too lulled by life’s constant stream of distractions to notice. Dentist appointment and ballet rehearsal, chicken on the grill and a trip to buy new running shoes, then without warning (or consulting) us, the Maker zipped open the skies and unleashed the fury of the natural world. We watched helplessly as destruction ensued. Even in the midst of the destruction, Julie sees glimpses of joy and mercies new every morning. Read more. 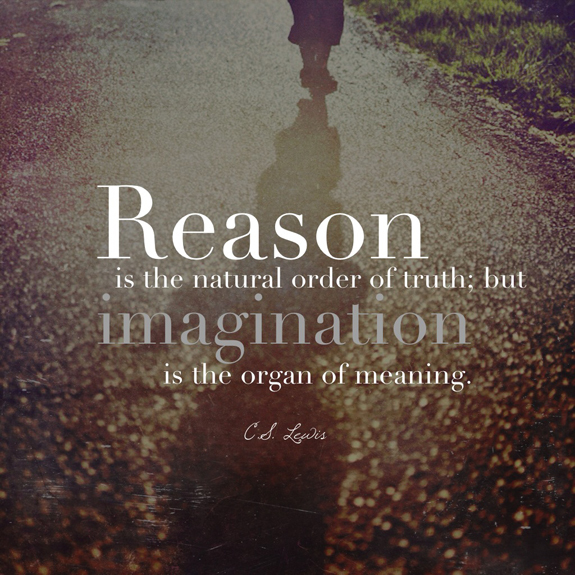 "…imagination is the organ of meaning." Insight from C.S. Lewis. Artwork from Paul Boekell. Okay, fellow imaginative parents, I have a question for you: Show of hands, how many of you really love to talk about math with your kids? If we were gathered together, I bet I’d be facing a stoic sea of shoulders broken by one individual in back frantically waving. (There’s always a brilliant one, isn’t there?) I get it. Like most everyone else here, I love language and narrative and instilling an adoration of them in my little ones. Trigonometry, calculus, and balancing my checkbook? Not so much. Like it or not, though, math is an important part of life, and young readers need to learn it sooner rather than later. That’s why I’m glad there are books like Taryn Souders’ Whole-y Cow! Fractions Are Fun. Not only does it teach necessary numerical skills, it does so in a way that story-hungry kids will love. As Loren says, "education's easier when married with enjoyment." Read more. Artist / Illustrator / Writer / Poet Ken Priebe has a fun post to liven up your Friday, a preview of his forthcoming book. There's no adequate way to preview it… go read it! It may be too late in the summer for some of us to take on this project with fresh fruit from the Farmer's Market, but pretty soon autumn will be filled with freshly picked apples, so maybe we'll still get a chance to try out these Farmer's Market DIY Dishtowels. Check it out over at Mom Colored Glasses. I have no idea how they made this video. I'm pretty sure it's magic. 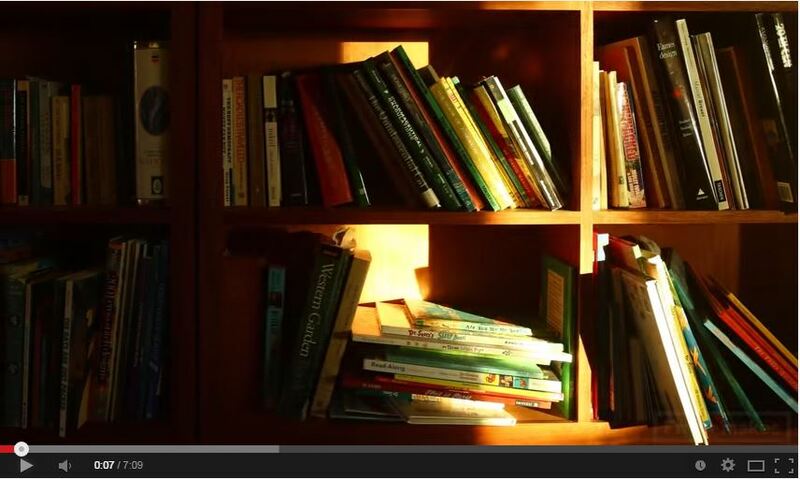 Of course, this video reminds me of our friend Kelly Keller's rant about Pintrest bookshelves. You can enjoy that here.